/Projects & Tasks /How to Track Progress in Projects in Mangoapps? The Project is one of the most critical module of MangoApps. Thus Reporting and Task view on UI helps us understand the status of each tasks in the project and how that impacts the health of the project. 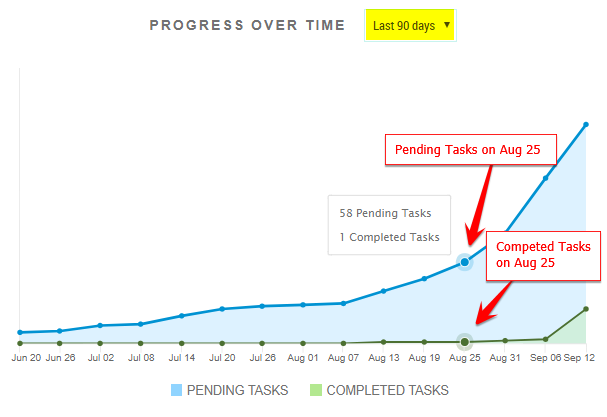 Progress view for tasks in each project is a graph that provides a visual representation of the health of a project by displaying completed vs pending tasks over time. This view is great to see work progress on a per resource basis. This visualization gives a leg up over competitors, making it easier to see the bottlenecks slowing down the whole project and make necessary task re-assignment and do milestone re-planning to keep the project on track. Under the Progress View, users who are part of the project can filter the tasks for each milestone in the project, the resultant view will show Completed Vs Pending Tasks view using the following graphical patters; Below are the graphical charts that users can view inside the project. 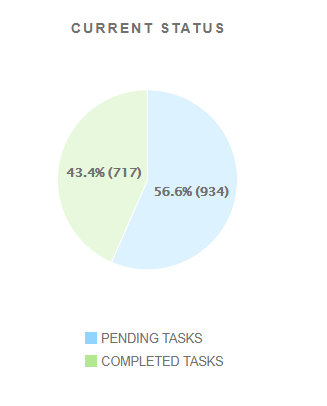 c. Progress by Responsible Person – Bar Chart – This graphical representation shows all the Pending Vs Completed Tasks (in %) for the task assignee inside the project for the milestone. How Can I Setup Jira in Mangoapps?